Cacheted covers with the big palm cachet. 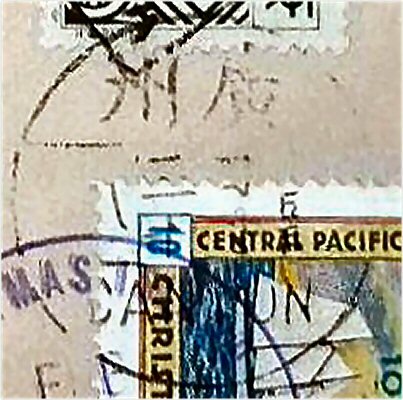 6 April 2019 : 121 covers. 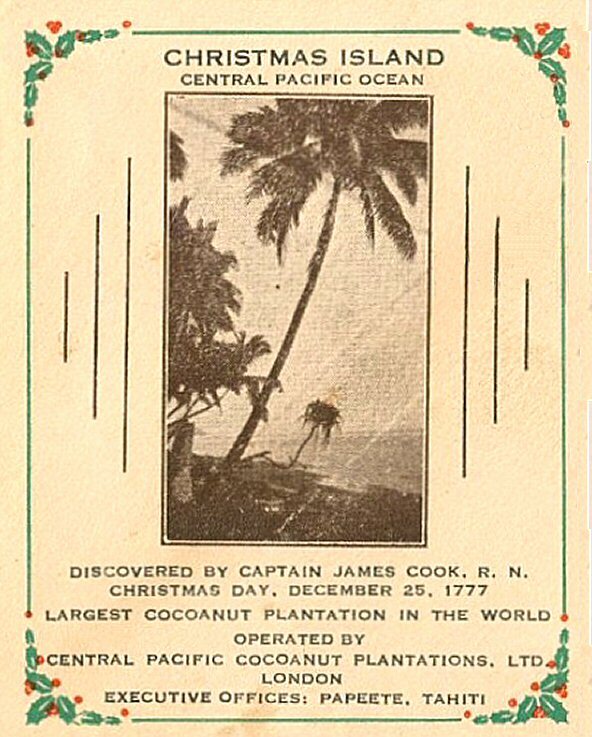 Please don't be astonished when you read here at the bottom of the cachet: "Operated by Central Pacific Cocoanut Plantations Ltd, London" or at other places even "...... London, Paris". This sly fox Rougier named two accumulations of huts on Christmas Island "London" and "Paris". 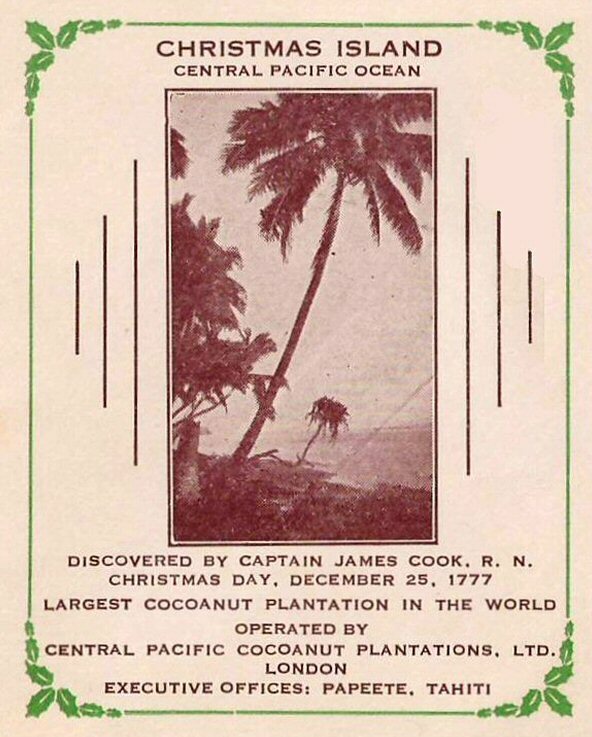 But the company was indeed registered in London. 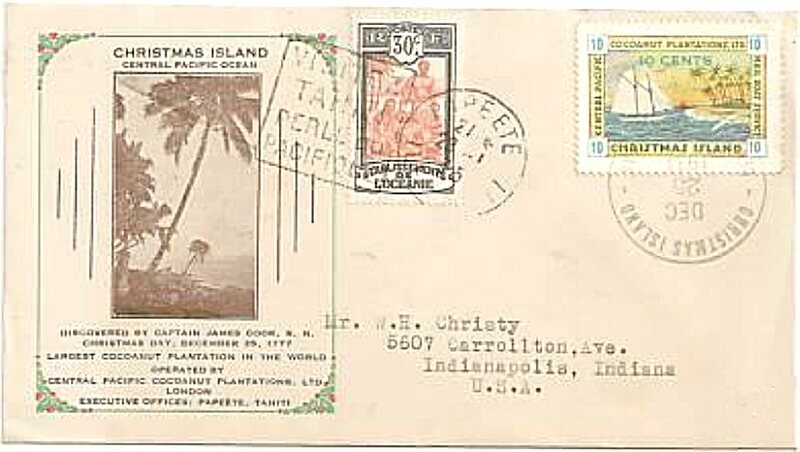 Big palm cachet cover - Gill Jr. This is a cover with the red berries misaligned in the corners of the cachet. 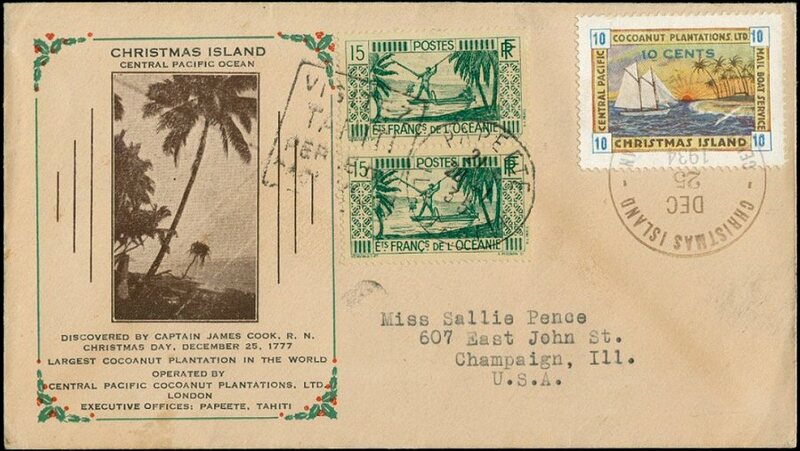 Big palm cachet cover - Pence. Cachet with shifted cherries. 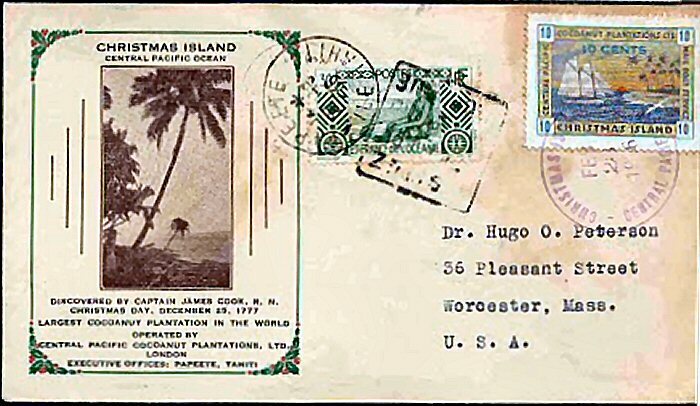 Image thanks to James Mulik. Big palm cachet cover - Grant - (David Gillis coll.). Big palm cachet cover - Friden - (David Gillis coll.). 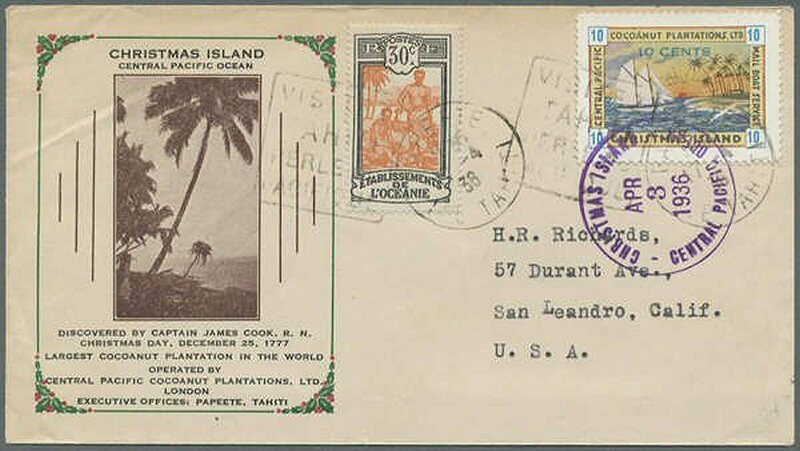 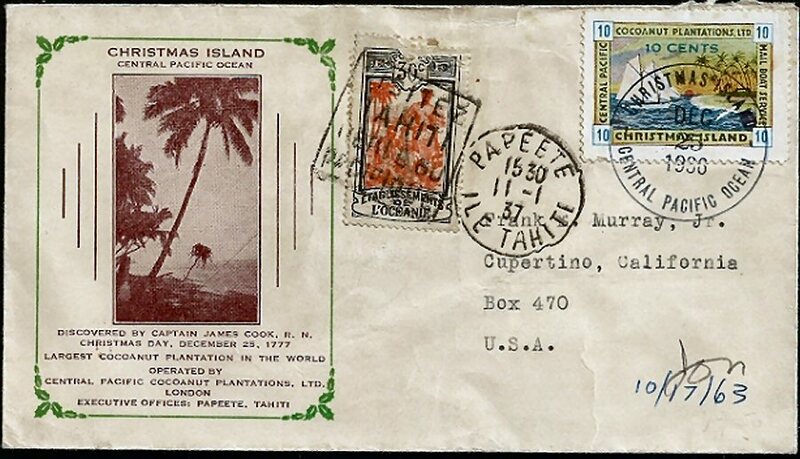 Big palm cachet cover - Rerucha - stamp quite bleeched - (seen on an Internet auction site). 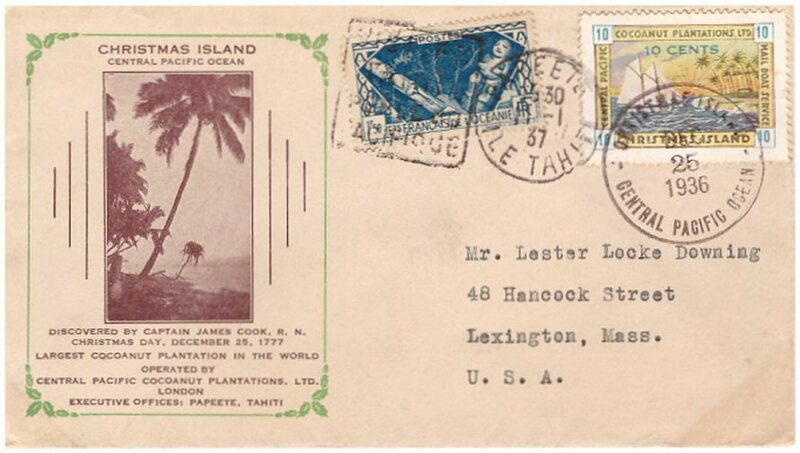 (seen on an Internet auction site). 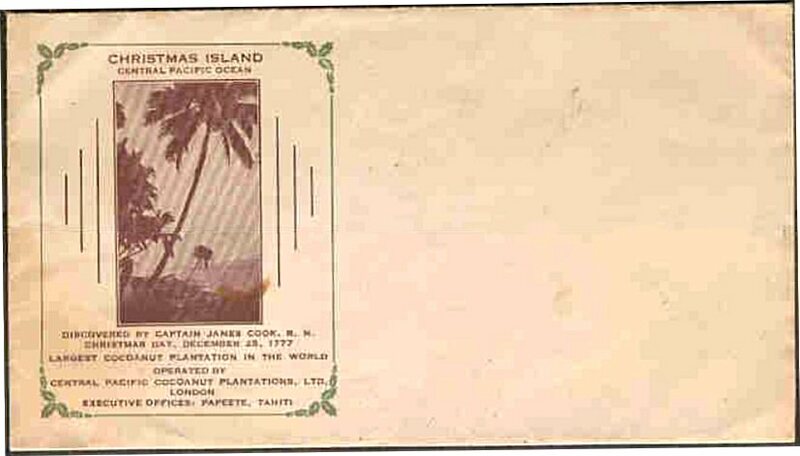 (seen on an Internet auction site). 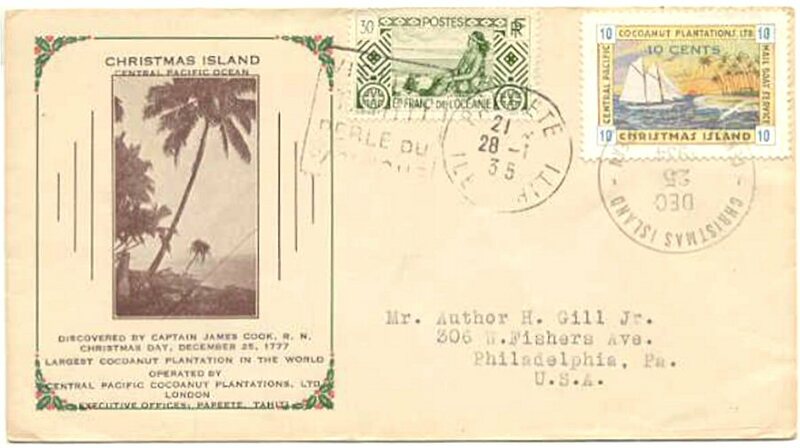 This cover looks like it was tin can mail to the U.S. and the can was untight. 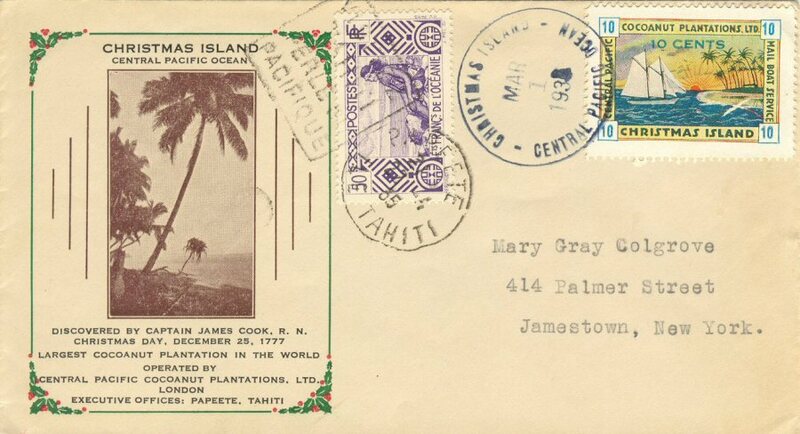 This is a rather awkward cover: Adress in blue, C.I. cancel upright DEC 25 ??? 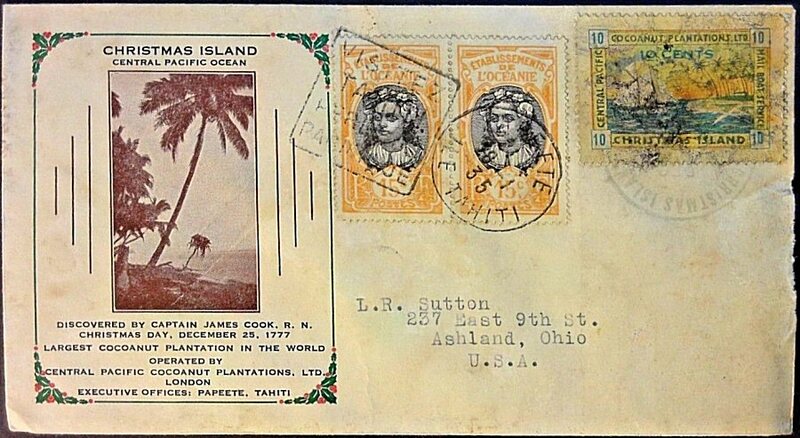 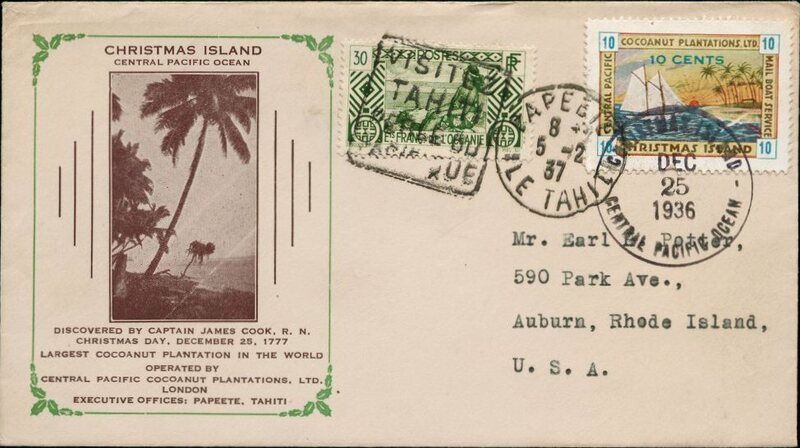 ?, Tahiti "VISITEZ" cancel rather clearly readable ) 29 (or 9 or 19) - 3 - 36. 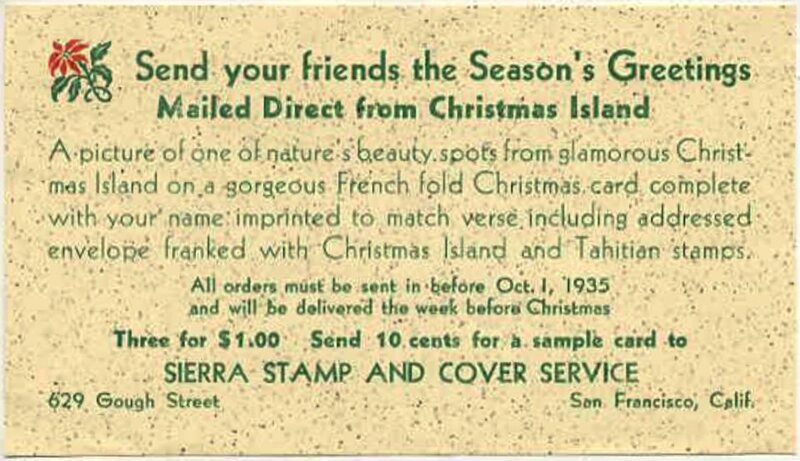 All DEC 25 1934 have the C.I. cancel upside down on the lower part of the local stamp. 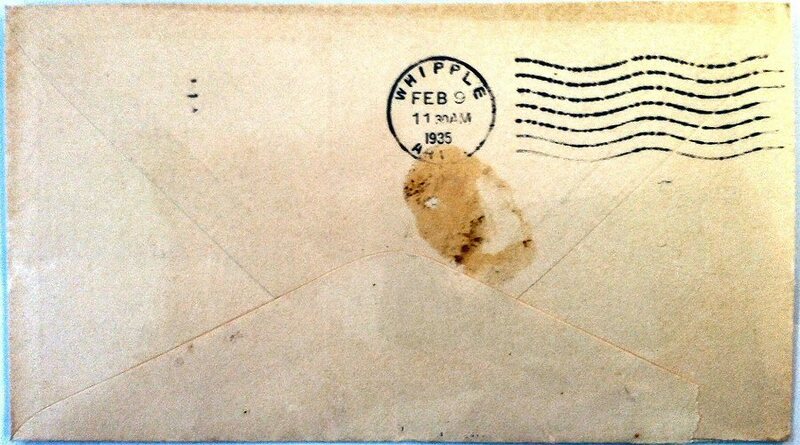 All addresses are in black. So this could be DEC 25 1935 but we have not registered any DEC 35 Big Palm cachet cover so far. Big palm cachet cover - Weil. 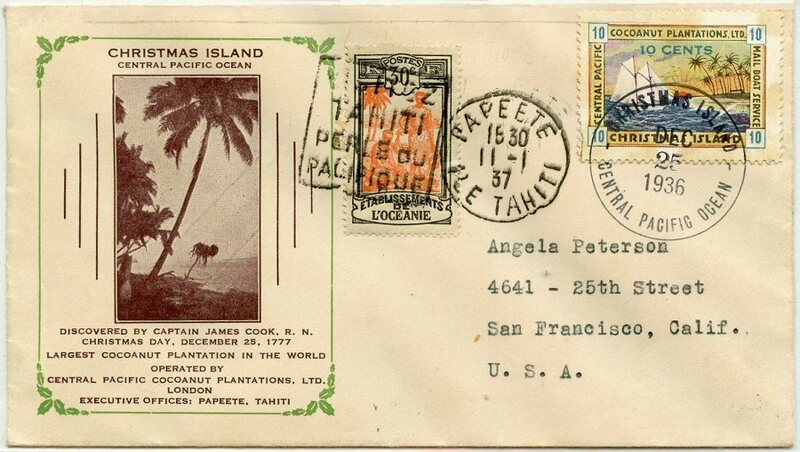 Cancelled Papeete on 22 April(?) 1935 with the "Perle" slogan postmark. 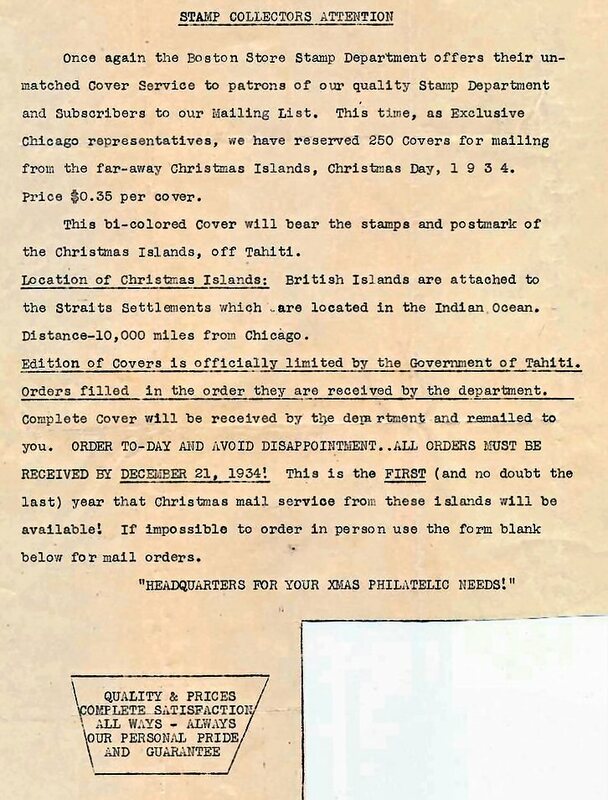 The year is not clear on the C.I. 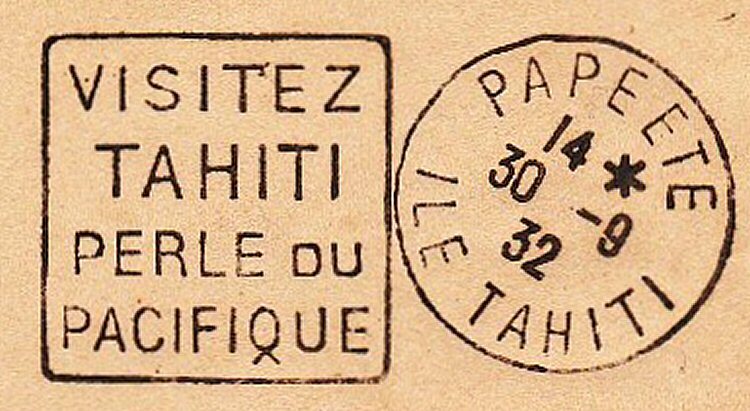 cancel but with the date of the Tahiti cancel 2(? 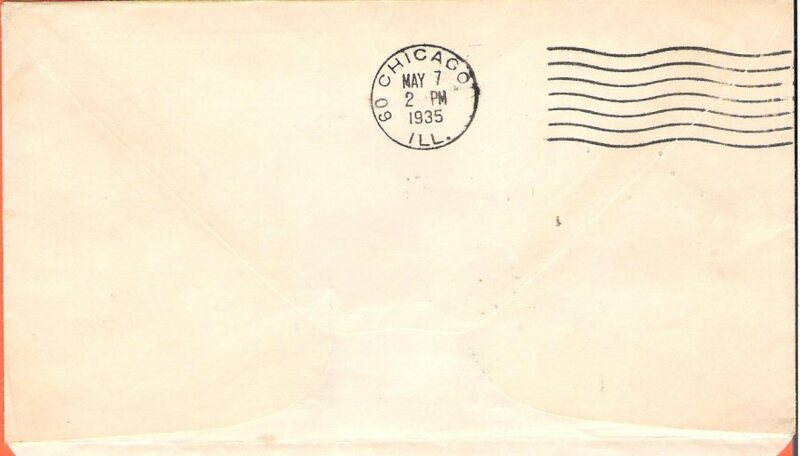 )9.3.36 could be 1935.
seen on an internet auction site. Big palm cachet cover - Colgrove. 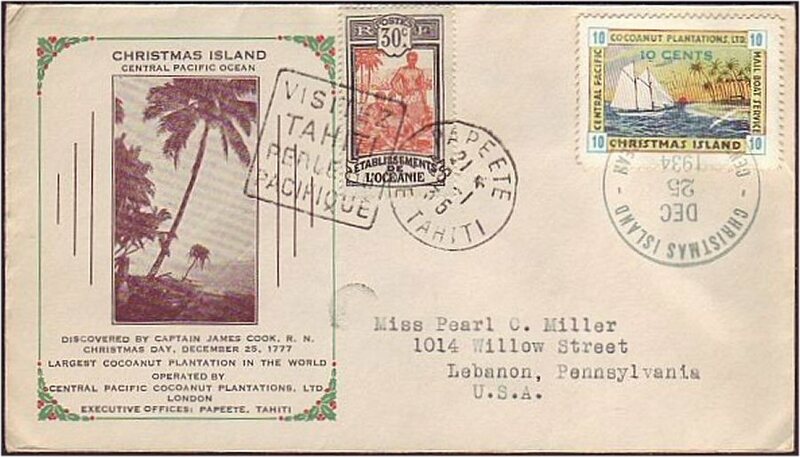 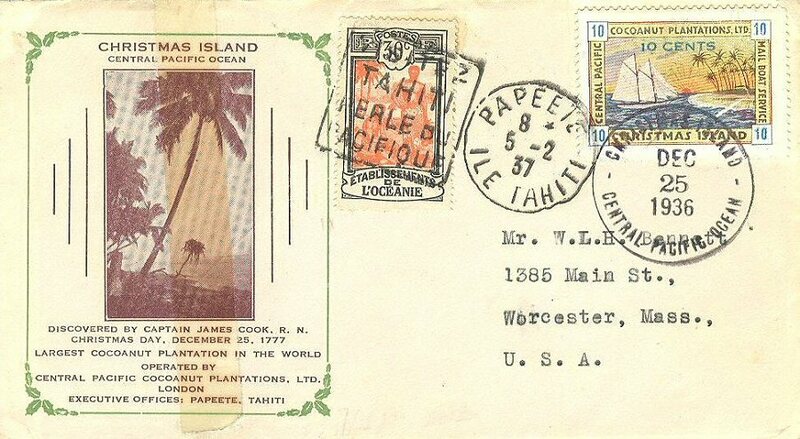 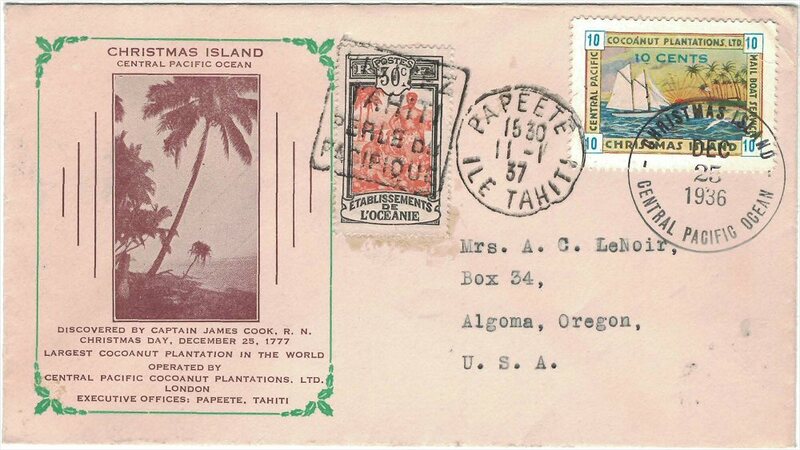 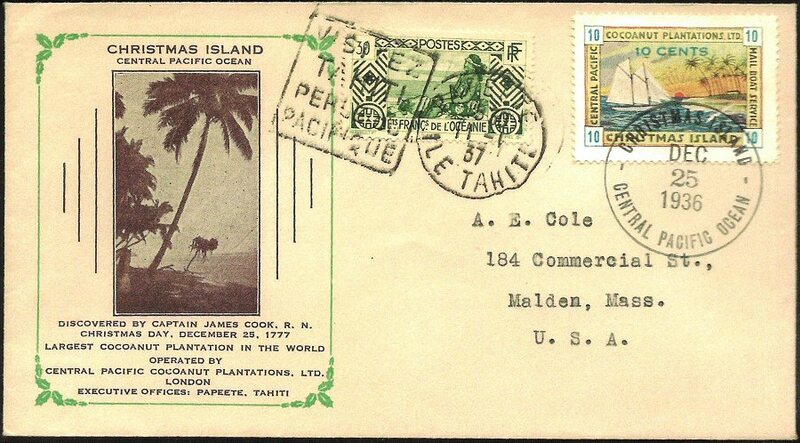 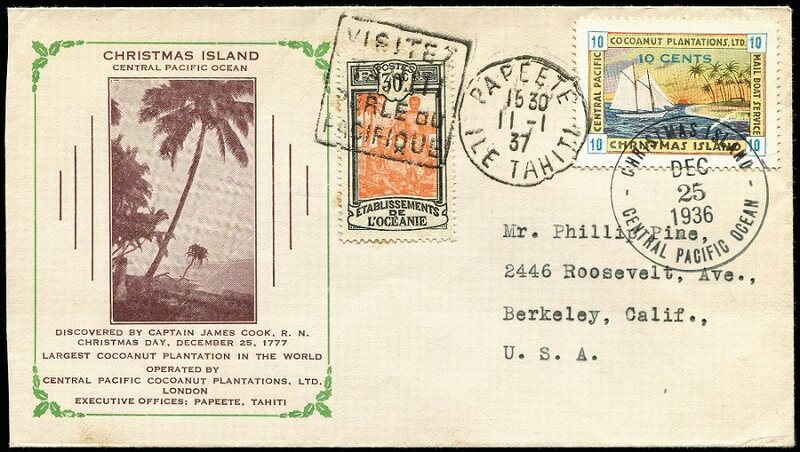 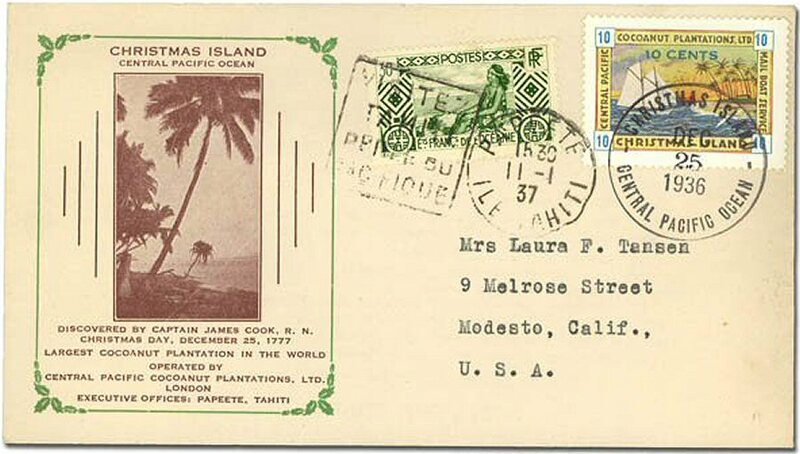 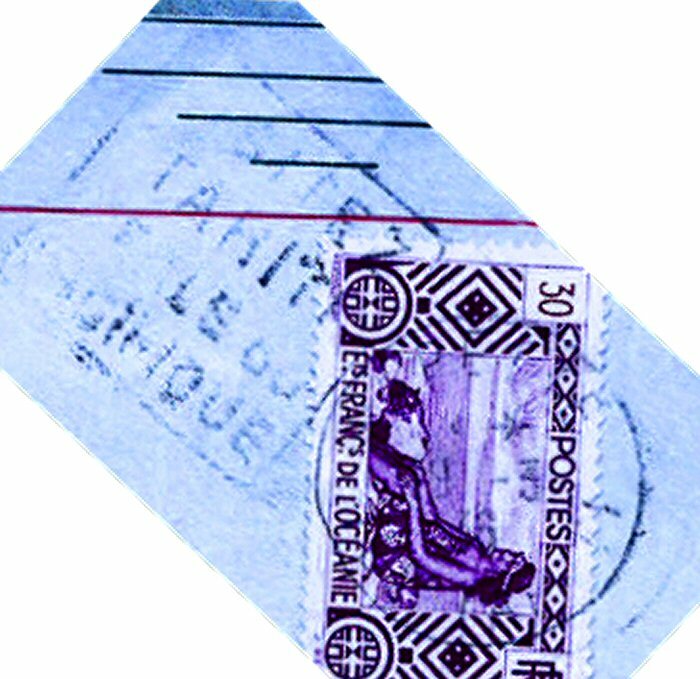 Cancelled Papeete on 22 April 1935 with the "Perle" slogan postmark. The year is not clear on the C.I. 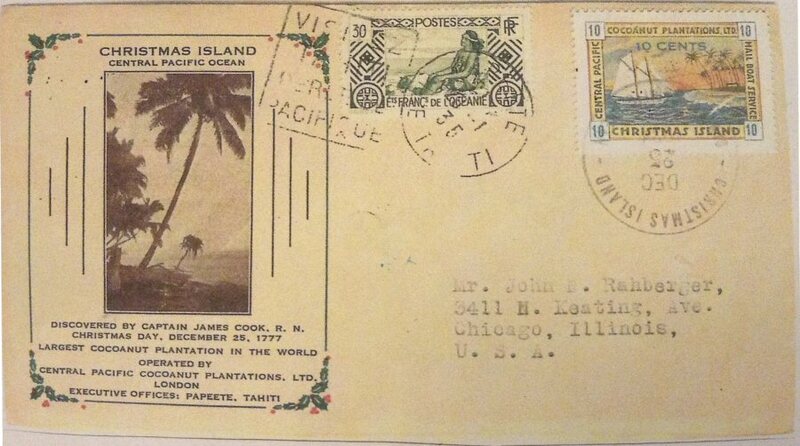 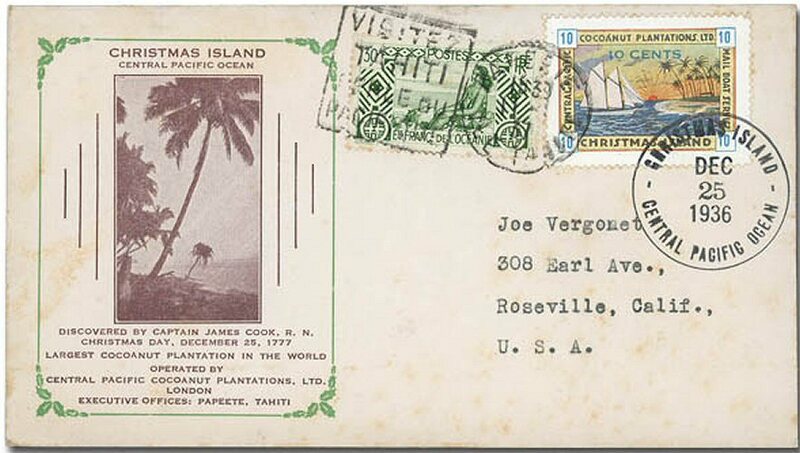 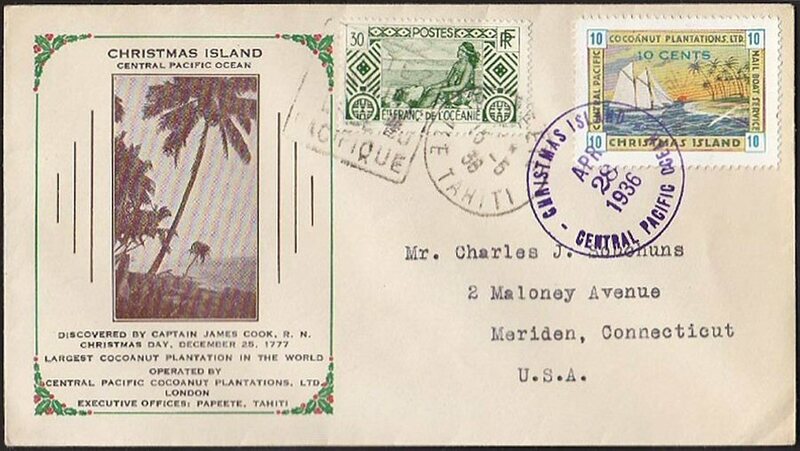 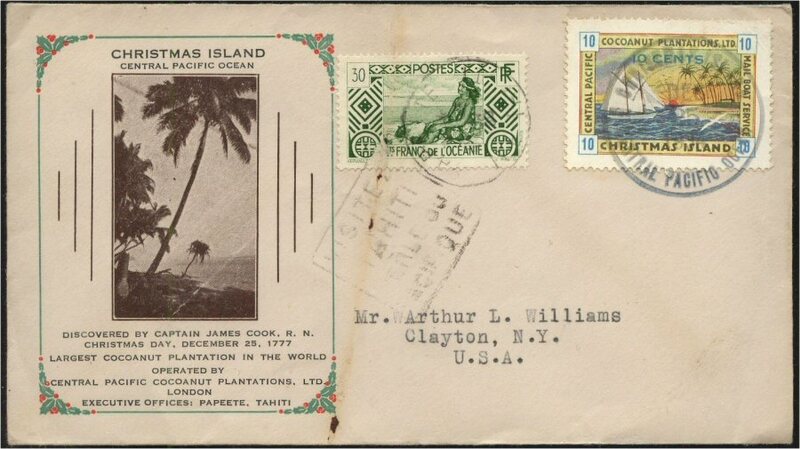 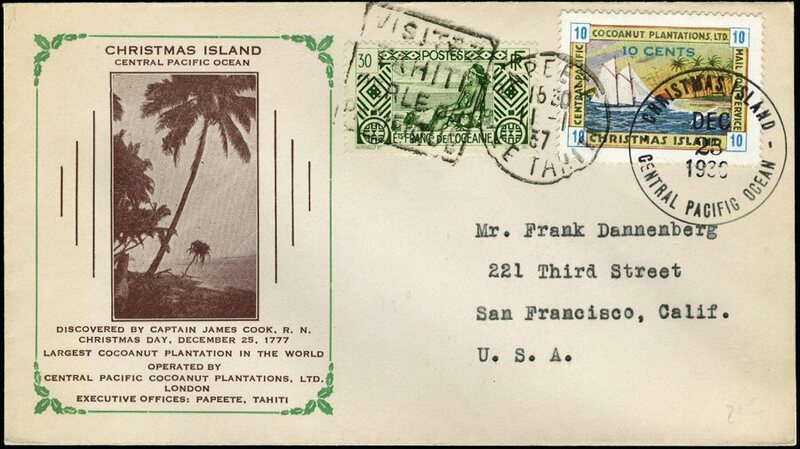 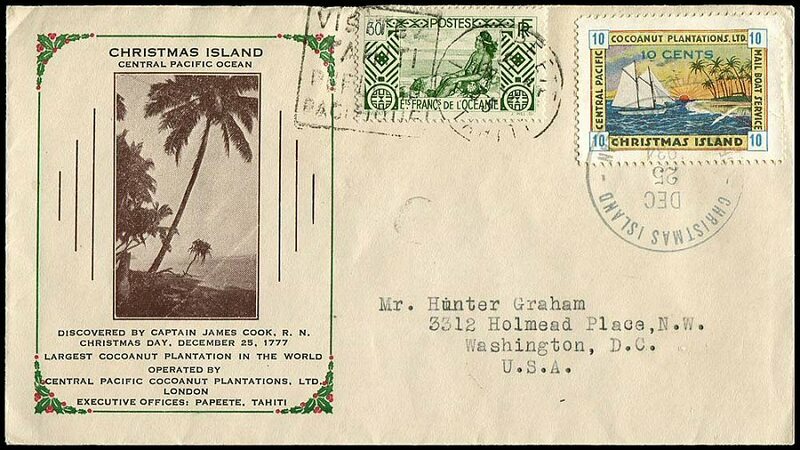 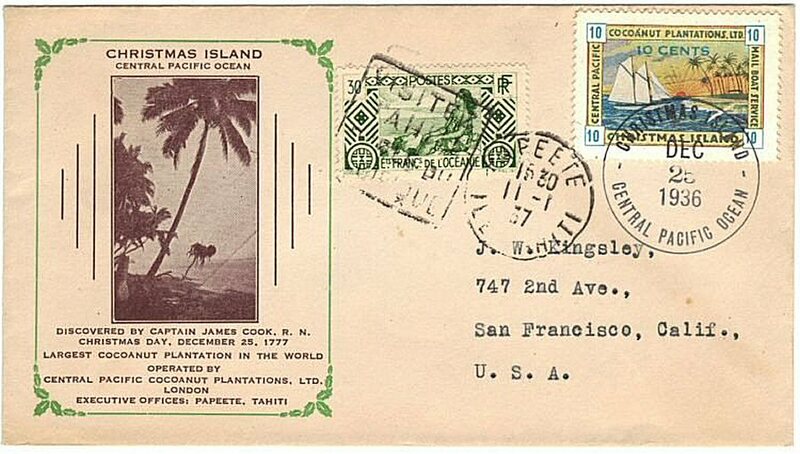 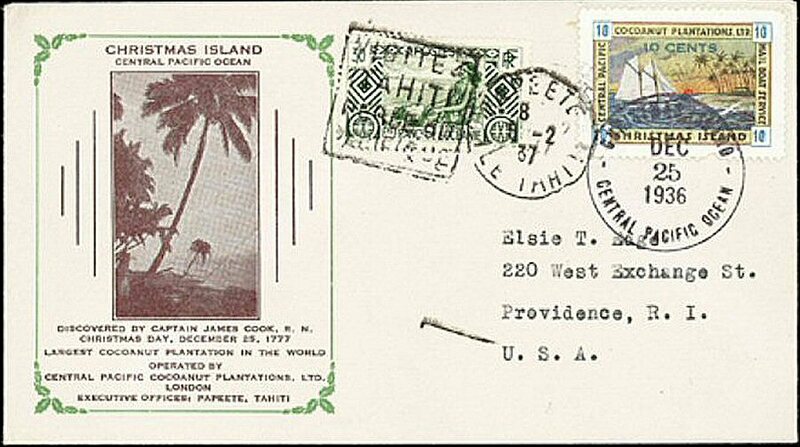 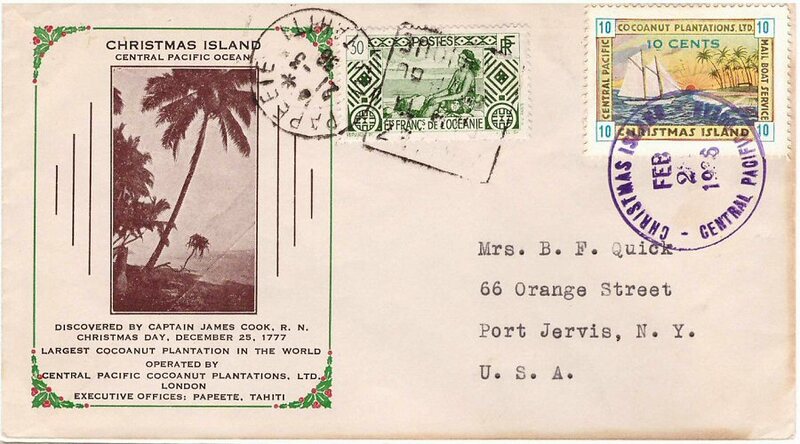 cancel but with the date of the Tahiti cancel it could be 1935(?). 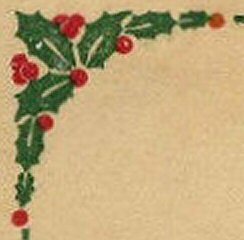 This one has a cachet with the berries in the holly, slightly out of alignment. 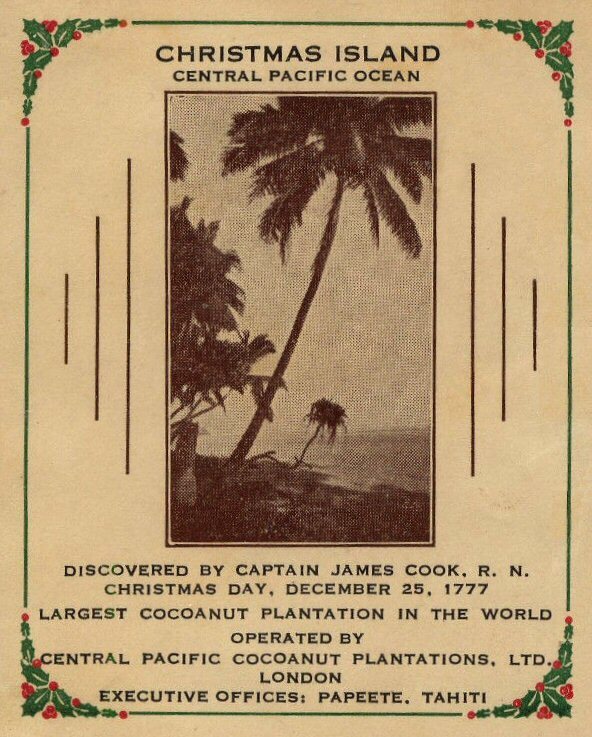 The year is not clear on the C.I. cancel but with the date of the Tahiti cancel it could be 1935. 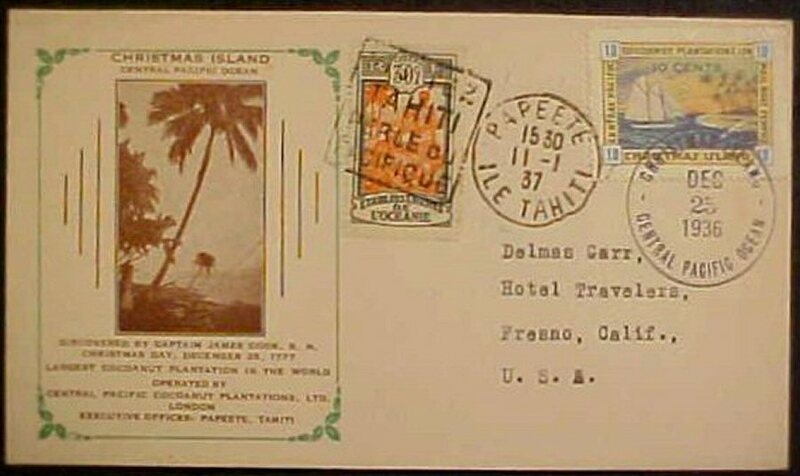 Big palm cachet cover - Hopley Yeaton ? Big palm cachet cover - Lemer.? 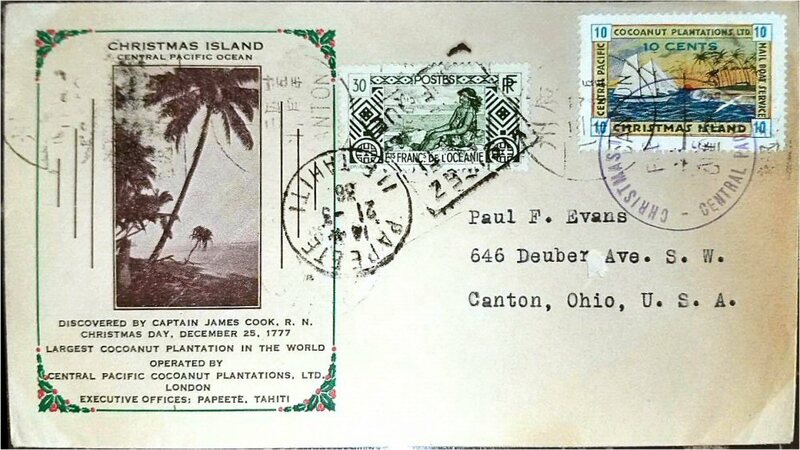 Big palm cachet cover - Evans. 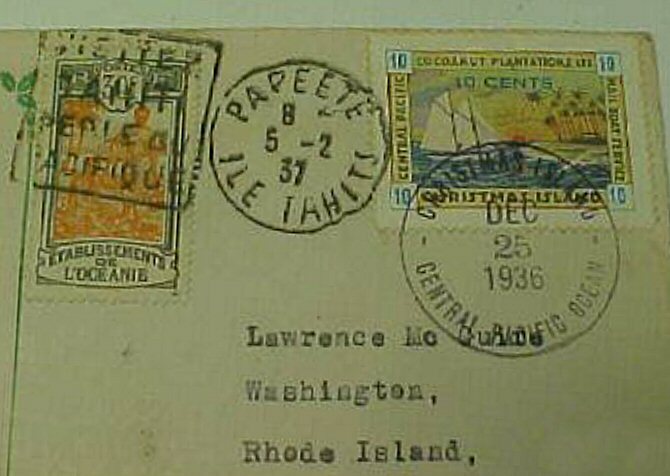 For some reason - maybe misplaced on the wrong ship - this cover went via Canton. 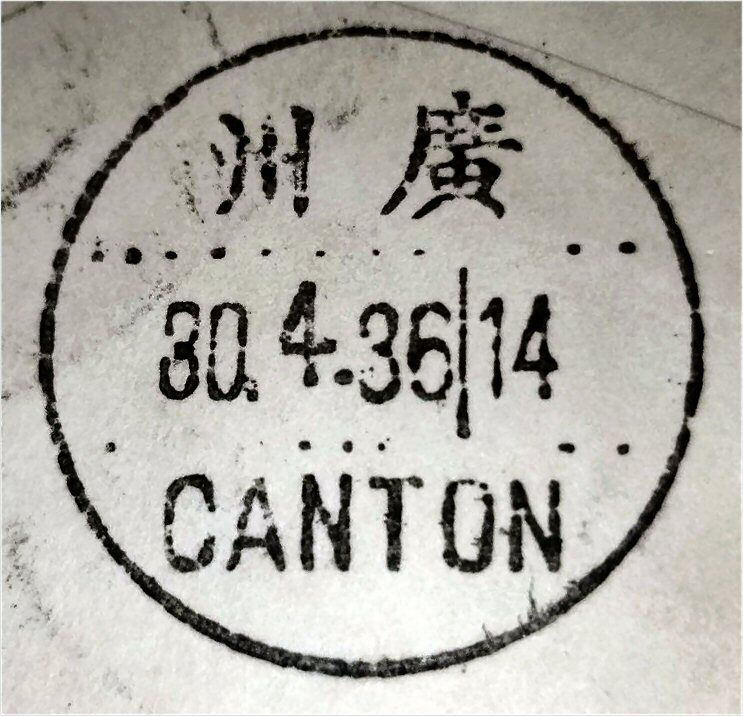 It has chinese Canton postmarks on front and an international Canton postmark on reverse. 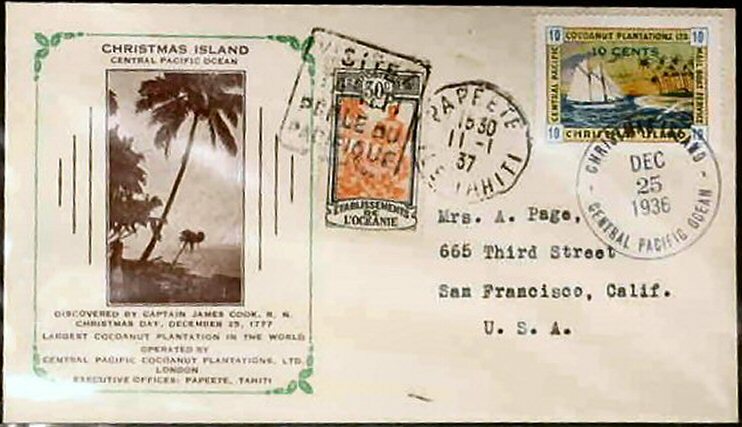 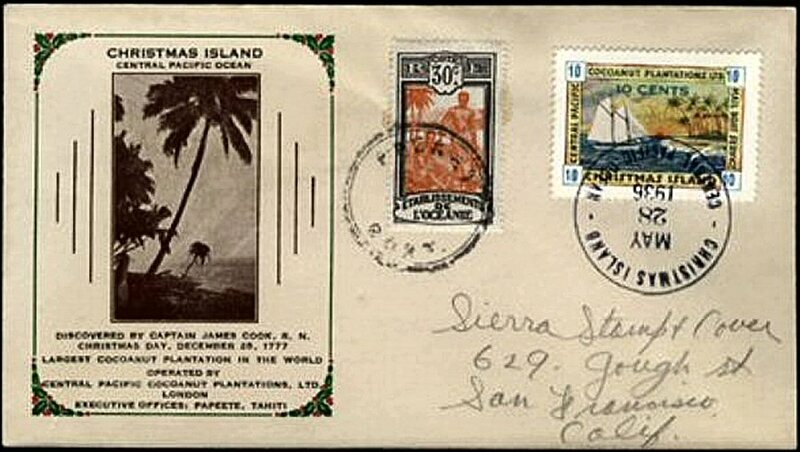 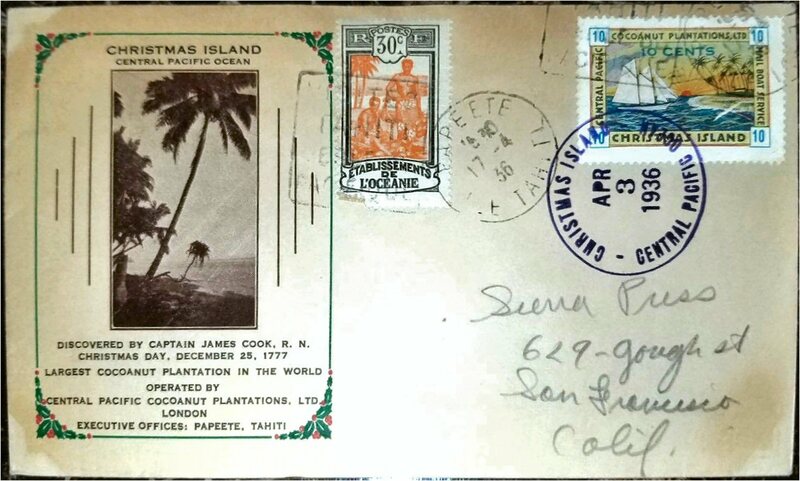 Big palm cachet cover - Die (Bleistift-)Adresse ist die des "Sierra Stamp & Cover Service" in 629 Gough Street, San Francisco, wie bei den kleine-Palme-Briefen. 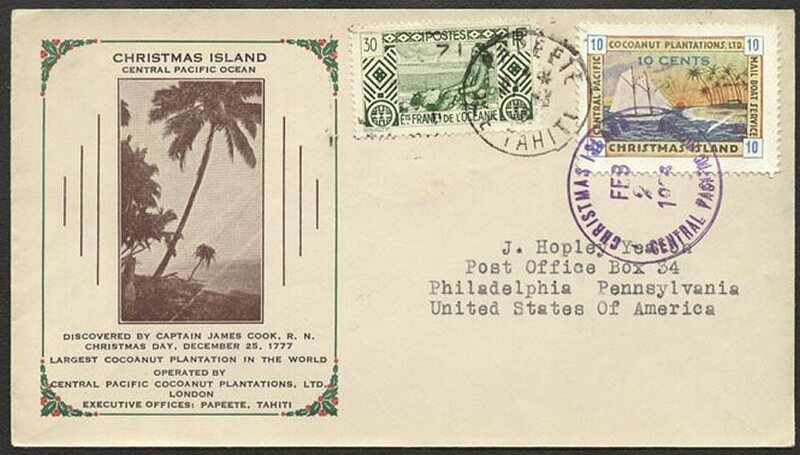 Great palm cachet: cover to Hartford, Conn., U.S.A.. Interesting: I have an image of the reverse here: it is cancelled with the Papeete cancel without slogan on 17.4.36 and with the "PERLE" slogan cancel on 20.4.36 but cancelled with flap open as part of the slogan is under the flap. Image thanks to seller Yanis848 on Delcampe. 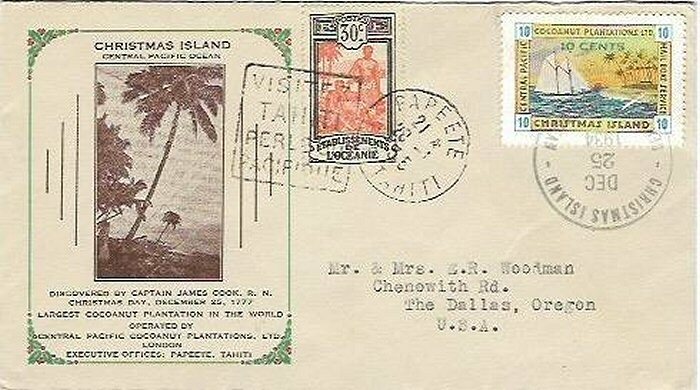 Big palm cachet cover - Sobchuns ? 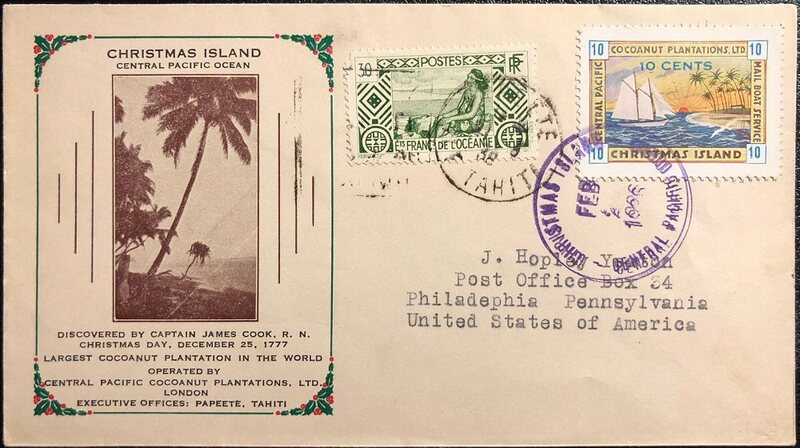 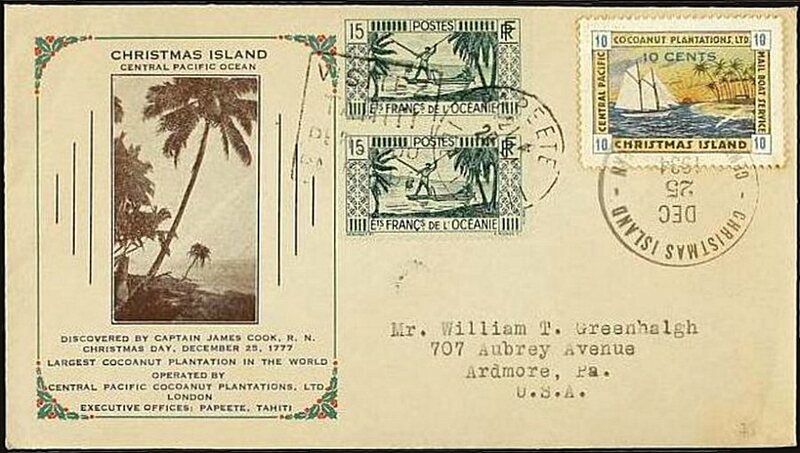 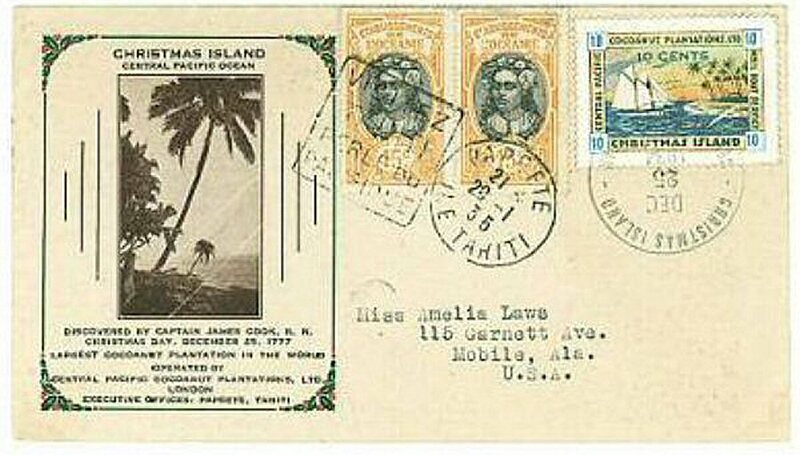 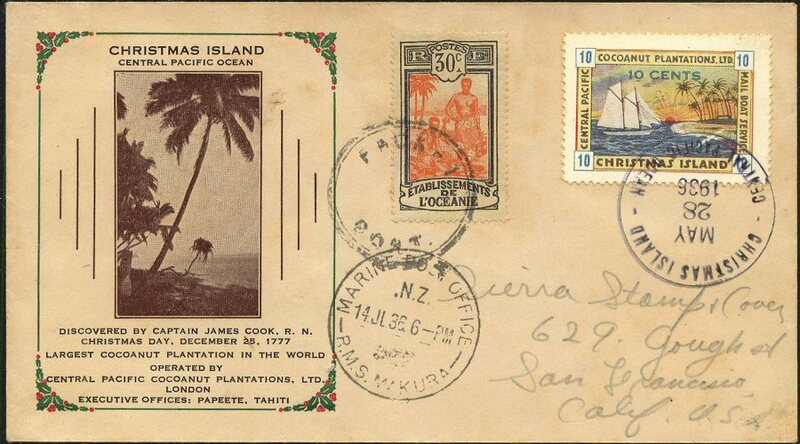 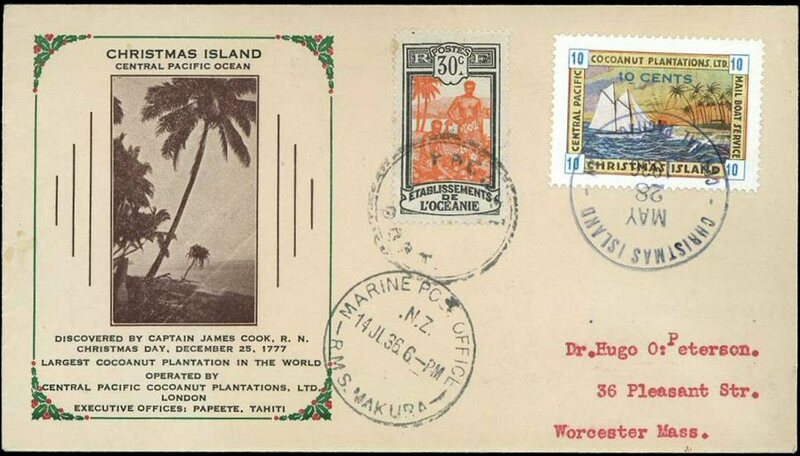 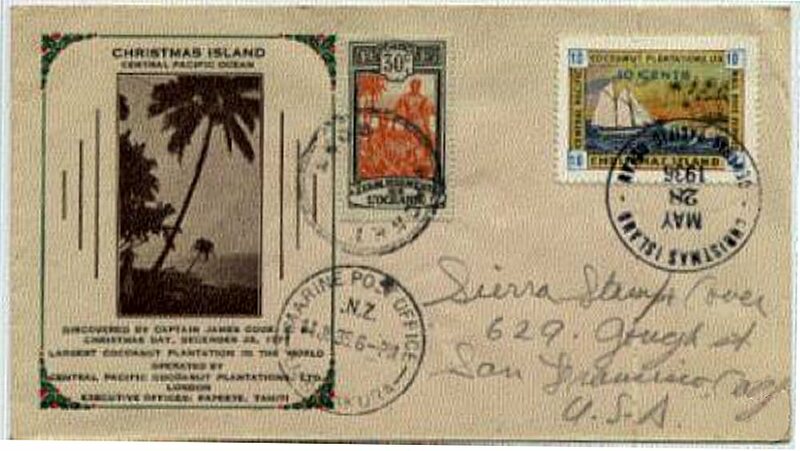 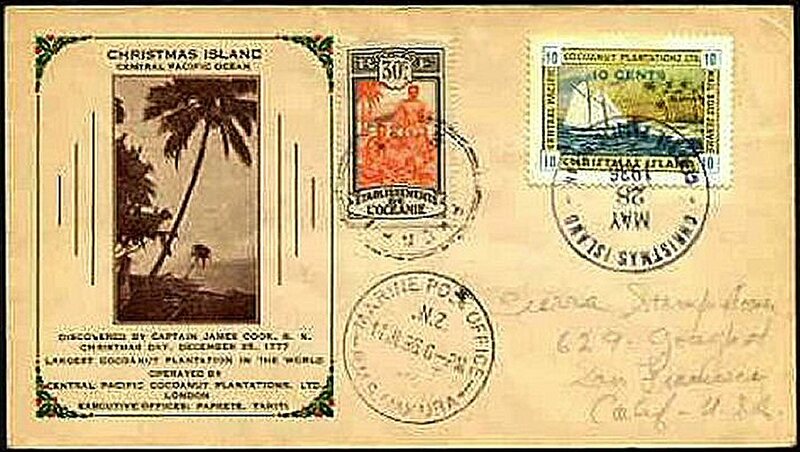 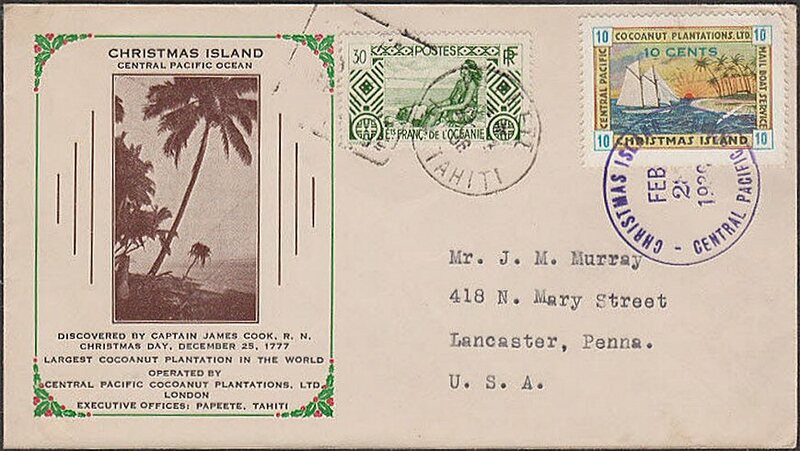 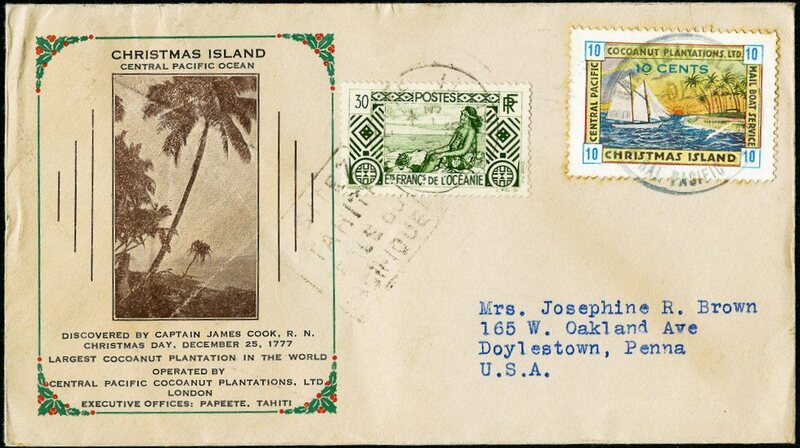 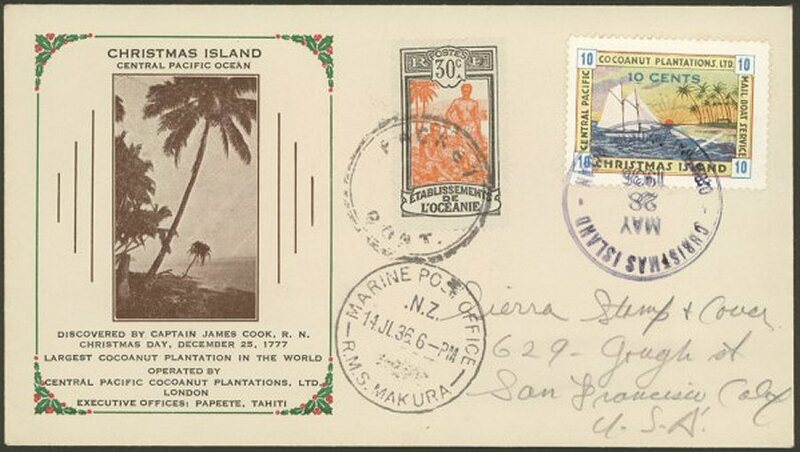 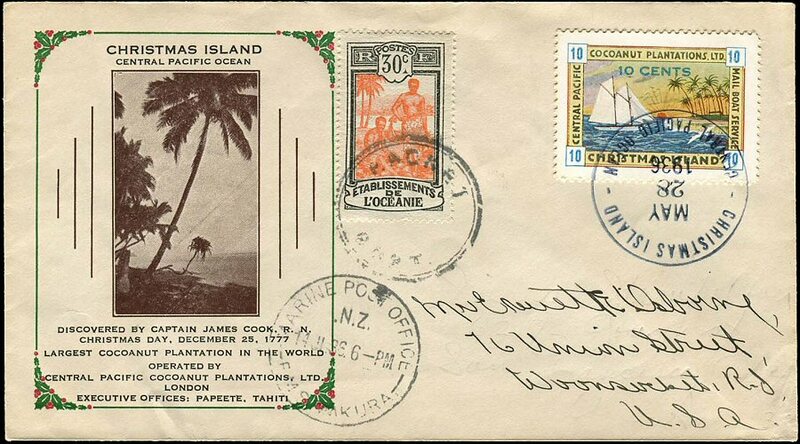 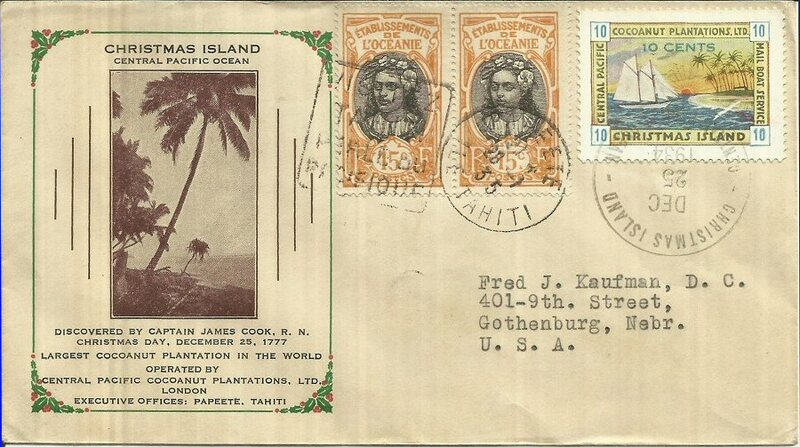 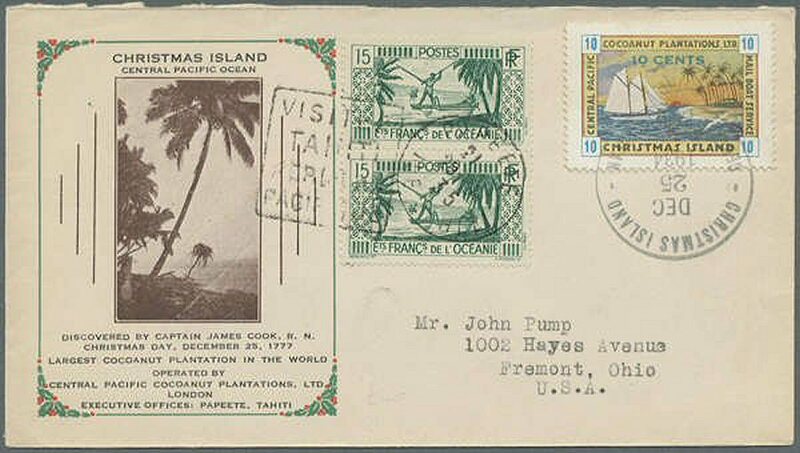 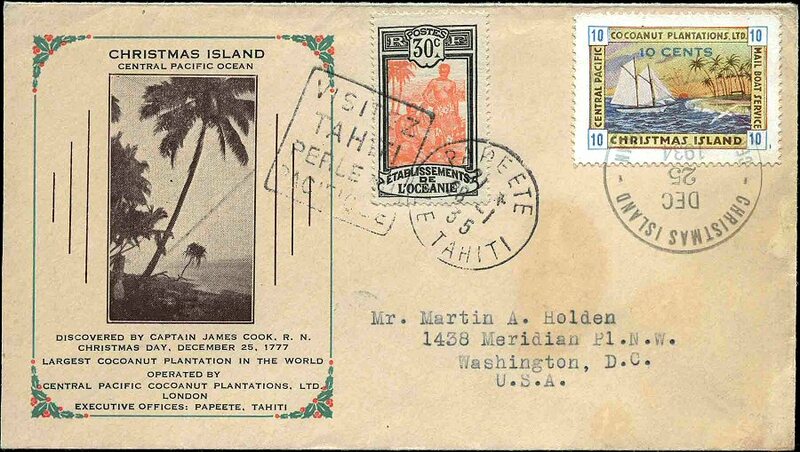 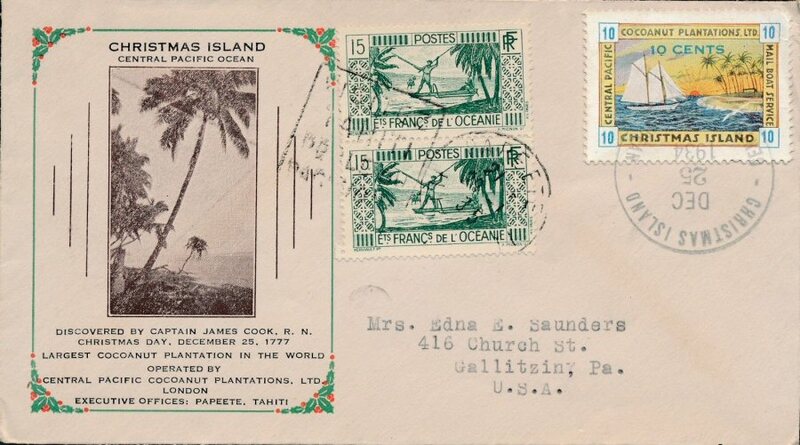 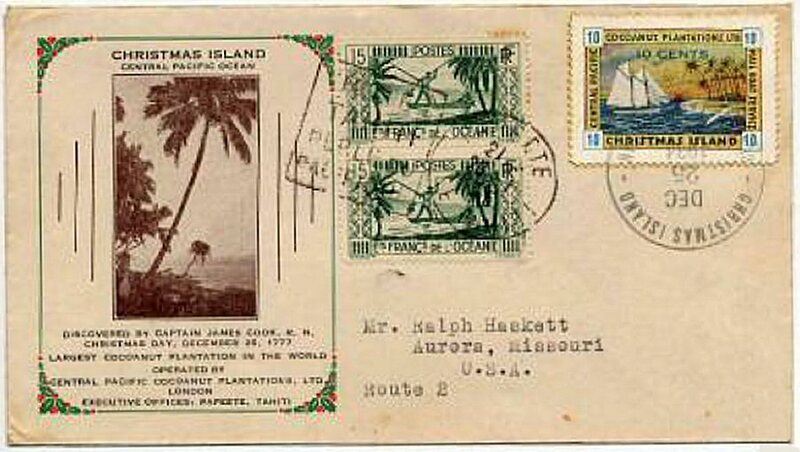 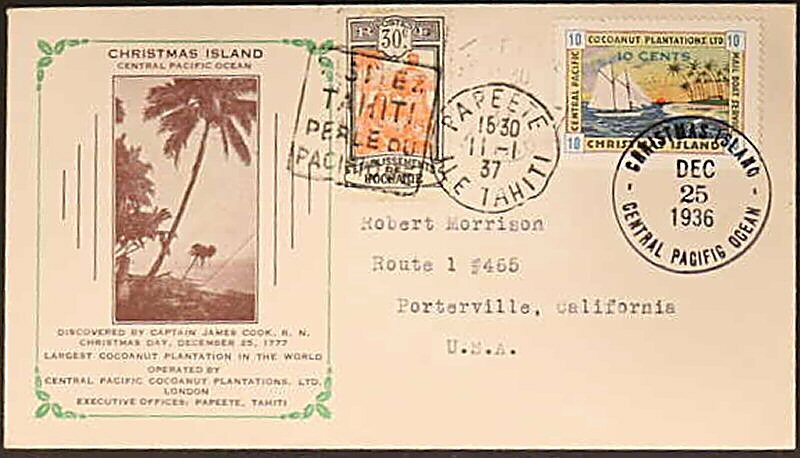 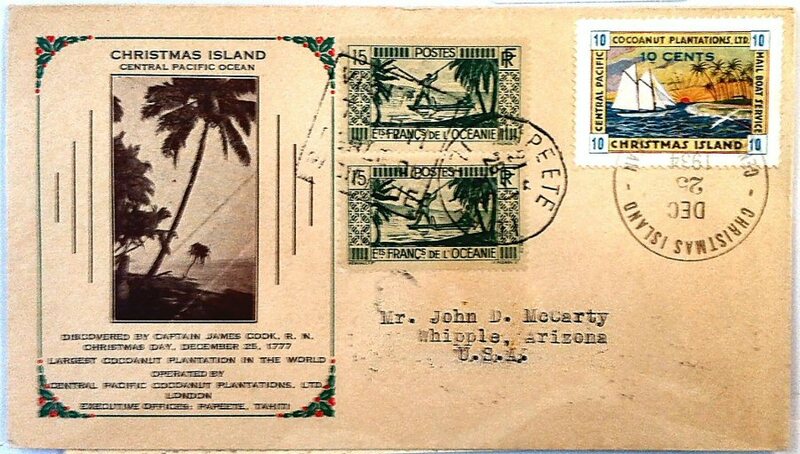 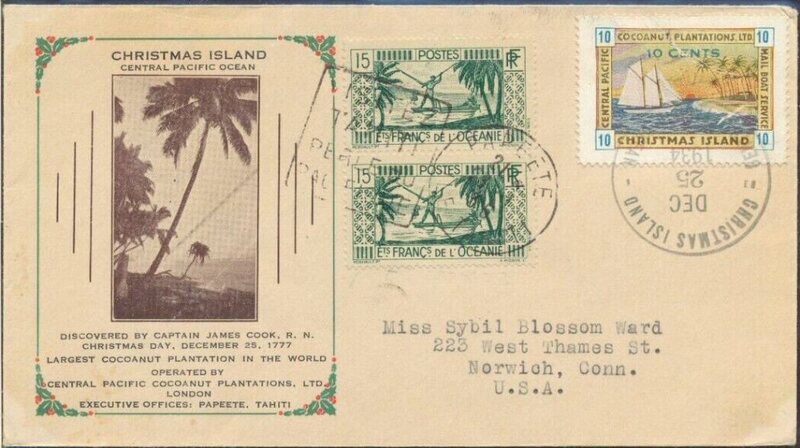 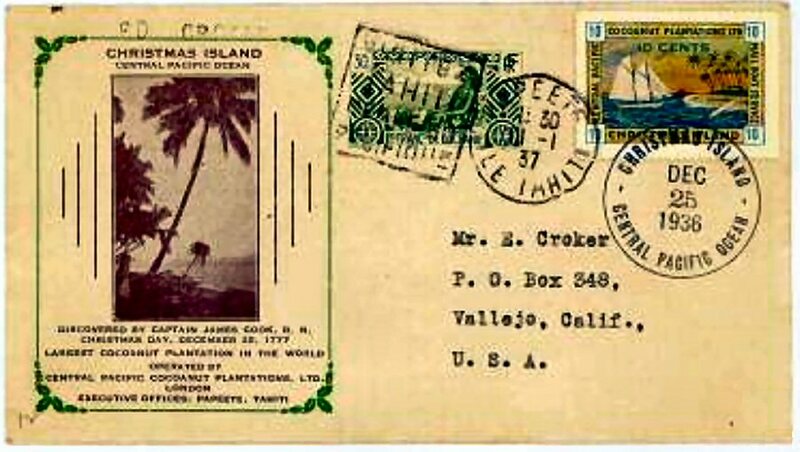 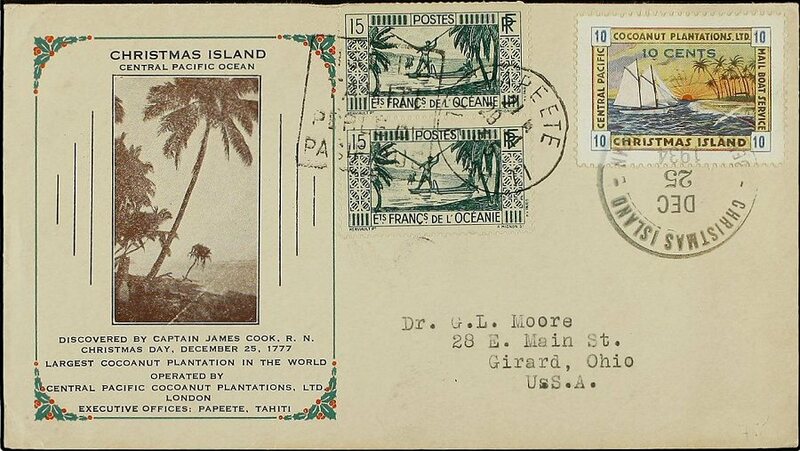 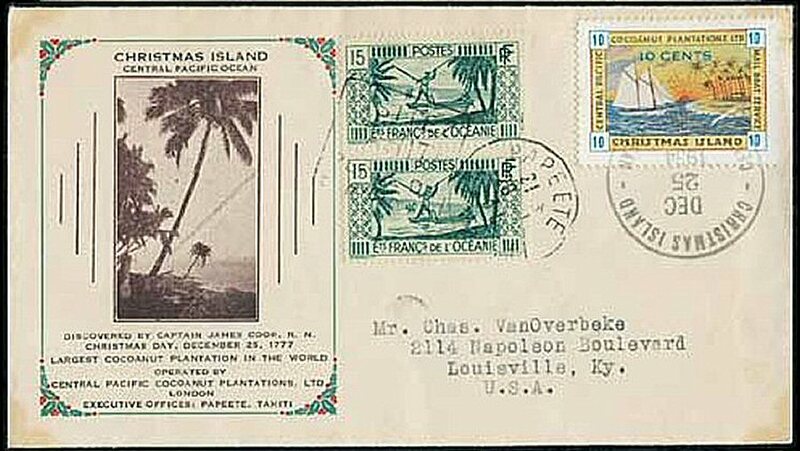 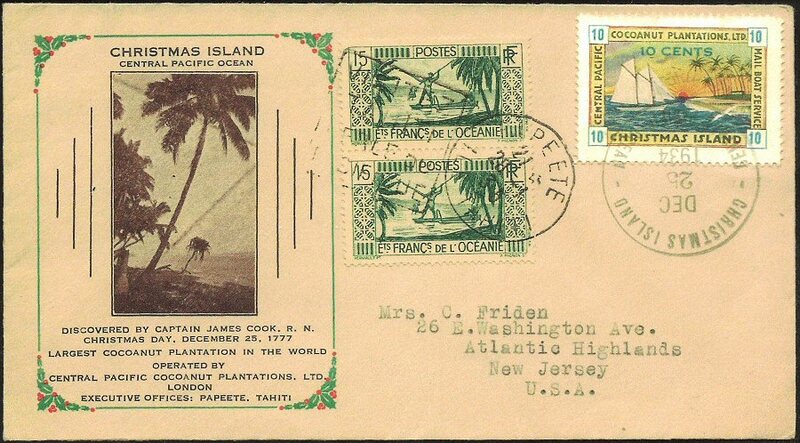 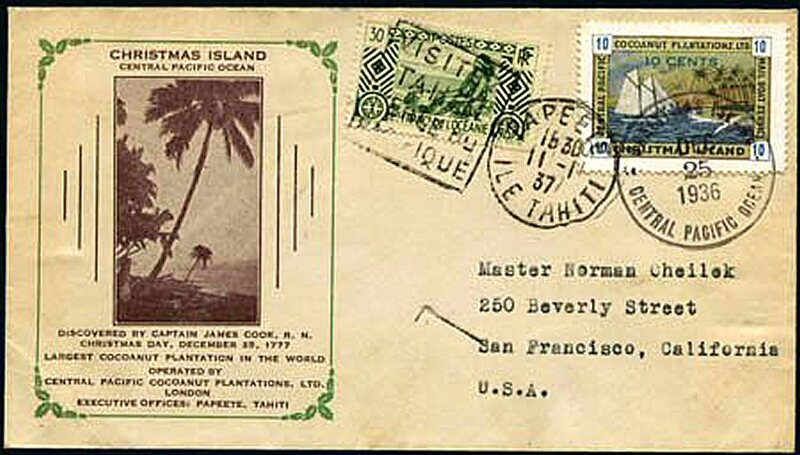 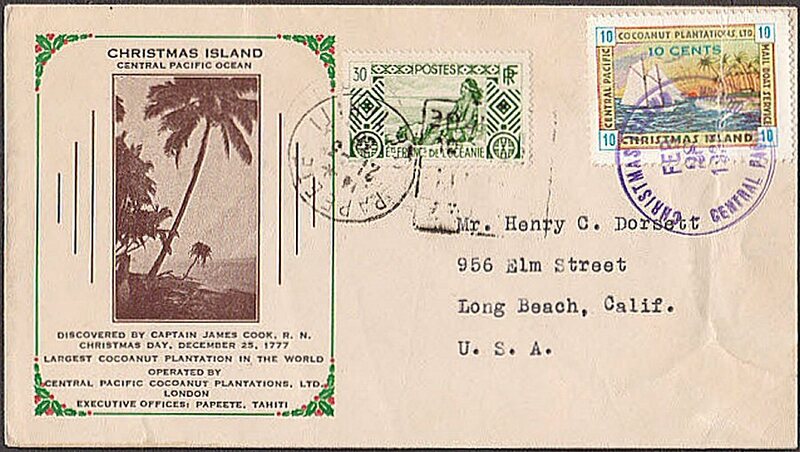 The Oceania stamp cancelled "Packet Post"
Die Ozeanienmarke ist gestempelt "Packet Post"
the same as on the small palm cachet covers. 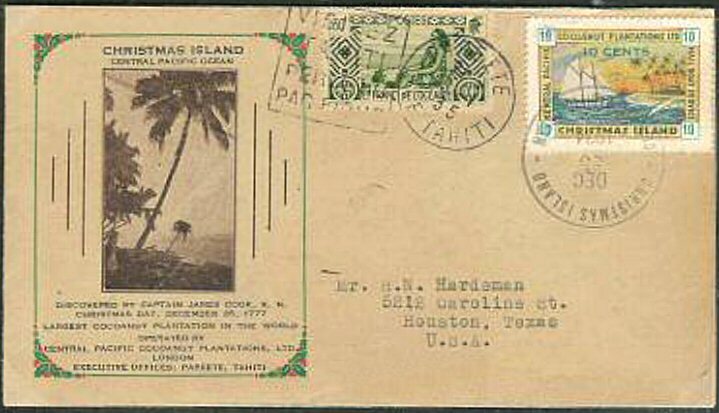 Big palm cachet cover - Johnson I. Order form included: it is interesting that they mistook Christmas Island (Pacific) for the Christams Island Indian Ocean. 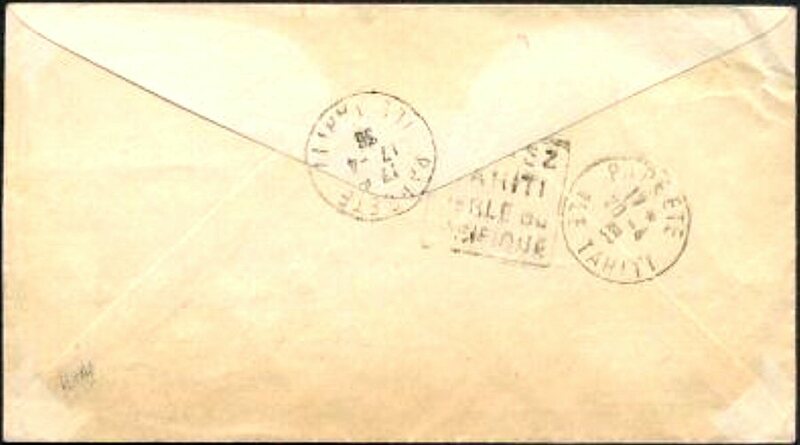 pencil manuscript to Sierra Stamps & Cover Co. 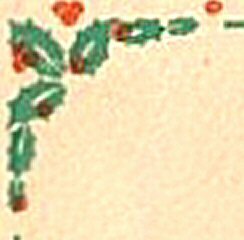 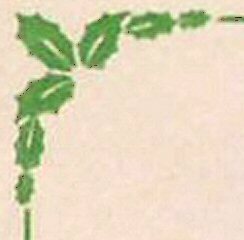 This is the cachet type without berries in the holly. 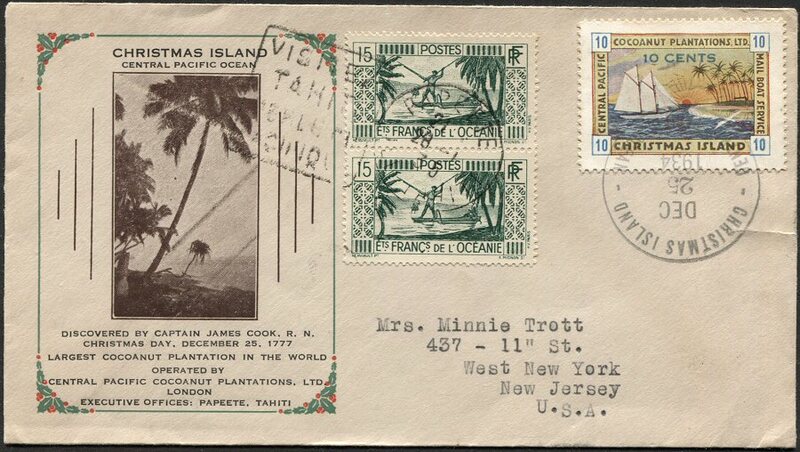 Cachet #3 - poor alignment of the red cherries. 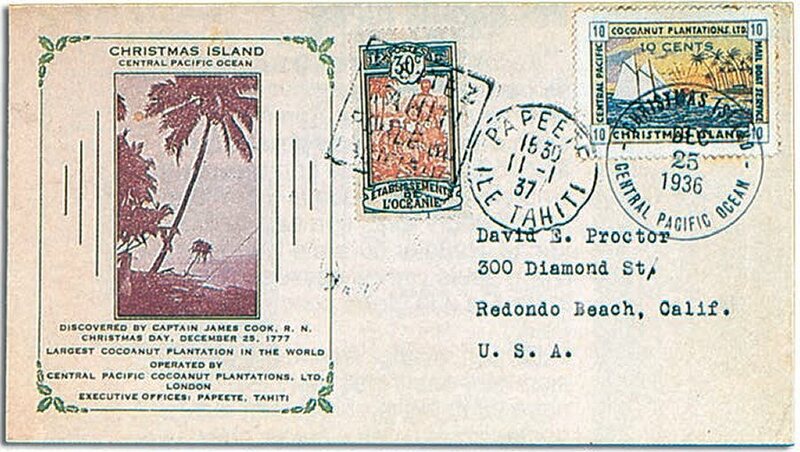 Cachet #3 corner - poor alignment of the red cherries.